This article is about algorithms for encryption and decryption. For an overview of cryptographic technology in general, see Cryptography. Encryption has long been used by militaries and governments to facilitate secret communication. Encryption is now used in protecting information within many kinds of civilian systems, such as computers, networks (such as for Internet e-commerce), mobile telephones, wireless microphones, wireless intercom systems, Bluetooth devices, and bank automatic teller machines. Encryption is also used in digital rights management to restrict the use of copyrighted material and in software copy protection to protect against reverse engineering and software piracy. Encryption, by itself, can protect the confidentiality of messages, but other techniques are still needed to verify the integrity and authenticity of a message; for example, a message authentication code (MAC) or digital signatures. Standards and cryptographic software and hardware to perform encryption are widely available, but successfully using encryption to ensure security is a challenging problem. A single slip-up in system design or execution can allow successful attacks. Sometimes an adversary can obtain unencrypted information without directly undoing the encryption. Encryption has been used to protect communications since ancient times, but only organizations and individuals with extraordinary need for confidentiality had bothered to exert the effort required to implement it. Encryption, and successful attacks on it, played a vital role in World War II. Many of the encryption techniques developed then were closely-guarded secrets (Kahn). In the mid-1970s, with the introduction of the U.S. Data Encryption Standard and public key cryptography, strong encryption emerged from the preserve of secretive government agencies into the public domain. The original information is known as plaintext, and the encrypted form as ciphertext. The ciphertext message contains all the information of the plaintext message, but is not in a format readable by a human or computer without the proper mechanism to decrypt it; it should resemble random gibberish to those not intended to read it. The operation of a cipher usually depends on a piece of auxiliary information, called a key or, in traditional NSA parlance, a cryptovariable. The encrypting procedure is varied depending on the key, which changes the detailed operation of the algorithm. A key must be selected before using a cipher to encrypt a message. Without knowledge of the key, it should be difficult, if not impossible, to decrypt the resulting cipher into readable plaintext. By whether they work on blocks of symbols usually of a fixed size (block ciphers), or on a continuous stream of symbols (stream ciphers). By whether the same key is used for both encryption and decryption (symmetric key algorithms), or if a different key is used for each (asymmetric key algorithms). If the algorithm is symmetric, the key must be known to the recipient and to no one else. If the algorithm is an asymmetric one, the encyphering key is different from, but closely related to, the decyphering key. If one key cannot be deduced from the other, the asymmetric key algorithm has the public/private key property and one of the keys may be made public without loss of confidentiality. The Feistel cipher uses a combination of substitution and transposition techniques. 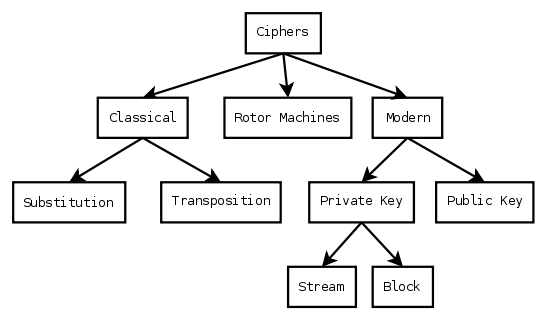 Most (block ciphers) algorithms are based on this structure. “Cipher” is alternatively spelled “cypher.” This variant, however, is now uncommon and often incorrectly considered an error by native speakers. Likewise, “ciphertext” was spelled as “cyphertext,” and so forth. It also got into Middle French as cifre and Medieval Latin as cifra, from the Arabic sifr (zero). The Roman number system was very cumbersome because there was no concept of zero (or empty space). The concept of zero (which was also called “cipher”), which we all now think of as natural, was very alien in medieval Europe, so confusing and ambiguous to common Europeans that in arguments people would say “talk clearly and not so far fetched as a cipher.” Cipher came to mean concealment of clear messages or encryption. The English used “zero” for “0,” and “cipher” from the word “ciphering” as a means of computing. Dr. Al-Kadi (ref-3) concluded that the Arabic word sifr, for the digit zero, developed into the European technical term for encryption. In non-technical usage, a “(secret) code” typically means a “cipher.” Within technical discussions, however, the words “code” and “cipher” refer to two different concepts. Codes work at the level of meaning—that is, words or phrases are converted into something else and this chunking generally shortens the message. Ciphers, on the other hand, work at a lower level: The level of individual letters, small groups of letters, or, in modern schemes, individual bits. Some systems used both codes and ciphers in one system, using superencipherment to increase the security. In some cases the terms codes and ciphers are also used synonym to substitution and transposition. Historically, cryptography was split into a dichotomy of codes and ciphers, and coding had its own terminology, analogous to that for ciphers: encoding, codetext, decoding, and so on. However, codes have a variety of drawbacks, including susceptibility to cryptanalysis and the difficulty of managing a cumbersome codebook. Because of this, codes have fallen into disuse in modern cryptography, and ciphers are the dominant technique. There are a variety of different types of encryption. Algorithms used earlier in the history of cryptography are substantially different from modern methods, and modern ciphers can be classified according to how they operate and whether they use one or two keys. Historical pen and paper ciphers used in the past are sometimes known as classical ciphers. They include simple substitution ciphers and transposition ciphers. For example “GOOD DOG” can be encrypted as “PLLX XLP” where “L” substitutes for “O,” “P” for “G,” and “X” for “D” in the message. Transposition of the letters “GOOD DOG” can result in “DGOGDOO.” These simple ciphers and examples are easy to crack, even without plaintext-ciphertext pairs. Simple ciphers were replaced by polyalphabetic substitution ciphers which changed the substitution alphabet for every letter. For example “GOOD DOG” can be encrypted as “PLSX TWF” where “L,” “S,” and “W” substitute for “O.” With even a small amount of known or estimated plaintext, simple polyalphabetic substitution ciphers and letter transposition ciphers designed for pen and paper encryption are easy to crack. During the early twentieth century, electro-mechanical machines were invented to do encryption and decryption using transposition, polyalphabetic substitution, and a kind of “additive” substitution. In rotor machines, several rotor disks provided polyalphabetic substitution, while plug boards provided another substitution. Keys were easily changed by changing the rotor disks and the plugboard wires. Although these encryption methods were more complex than previous schemes and required machines to encrypt and decrypt, other machines such as the British Bombe were invented to crack these encryption methods. Modern encryption methods can be divided into symmetric key algorithms (Private-key cryptography) and asymmetric key algorithms (Public-key cryptography). In a symmetric key algorithm (e.g., DES and AES), the sender and receiver must have a shared key set up in advance and kept secret from all other parties; the sender uses this key for encryption, and the receiver uses the same key for decryption. In an asymmetric key algorithm (e.g., RSA), there are two separate keys: A public key is published and enables any sender to perform encryption, while a private key is kept secret by the receiver and enables only him to perform correct decryption. Symmetric key ciphers can be distinguished into two types, depending on whether they work on blocks of symbols of fixed size (block ciphers), or on a continuous stream of symbols (stream ciphers). Mathematical advances that allow new attacks or weaknesses to be discovered and exploited. Computational power available, i.e. the computing power which can be brought to bear on the problem. It is important to note that average performance/capacity of a single computer is not the only factor to consider. An adversary can use multiple computers at once, for instance, to increase the speed of exhaustive search for a key (i.e. “brute force” attack) substantially. Key size, i.e., the size of key used to encrypt a message. As the key size increases, so does the complexity of exhaustive search to the point where it becomes infeasible to crack encryption directly. Since the desired effect is computational difficulty, in theory one would choose an algorithm and desired difficulty level, thus decide the key length accordingly. An example of this process can be found at Key Length which uses multiple reports to suggest that a symmetric cypher with 128 bits, an asymmetric cypher with 3072 bit keys, and an elliptic curve cypher with 512 bits, all have similar difficulty at present. Claude Shannon proved, using information theory considerations, that any theoretically unbreakable cipher must have keys which are at least as long as the plaintext, and used only once: One-time pad. Al-Kadi, Ibrahim A. April 1992. The Origins of Cryptology: The Arab Contributions. Cryptologia 16(2): 97–126. Al-Kadi, Ibrahim A. Nov. 24-27, 1991. Cryptography and Data Security: Cryptographic Properties of Arabic. Proceedings of the Third Saudi Engineering Conference, Riyadh, Saudi Arabia. 2:910-921. This page was last modified on 22 September 2013, at 17:40.